An extremely cold (but also quite dry) storm system originating over Western Canada brought long-duration hard freezes to most regions and some snowfall to very low elevations in parts of Northern California late last week (including flurries on the beaches near Eureka and very substantial snowfall in Redding around 500 ft AMSL in the Northern Sacramento Valley). Some daily record lows were set for the month of December, and in a few places temperatures were colder than they have been at any point in several years. The remarkably cold modified Arctic airmass that has brought bitterly cold air to much of North America has now shifted eastward, and the West Coast is in the midst of a slow but substantial warming trend that will continue at least through the coming weekend. Temperatures will rise to above-normal levels, with a few record high temperatures possible early next week as offshore flow promotes compressional warming in favored regions, with possible fire weather concerns in Southern California. Later in the week, though, a weak low will ride down the eastern side of the seemingly ever-present Northeast Pacific ridge, perhaps bringing a few showers but more likely initiating yet another offshore wind event. In any case, any precipitation (if any) would be extremely light. Looking even farther ahead: it looks like the possible eastward eastward progression of the Madden-Julian Oscillation in the West Pacific has not transpired as was projected in the medium-term models, and West Coast weather has not become subsequently more active. Unfortunately, there is actually quite good model agreement on the overall pattern over the East Pacific through the end of the month: the huge ridge over the Eastern Pacific is expected to persist and perhaps grow even more, continuing the extraordinarily dry pattern over California but allowing for occasionally large swings in temperature as a very cold airmass over Canada is occasionally able to spill westward in weak or even slightly retrogressive (east to west) zonal flow. In short: California (and, in fact, much of the Pacific Coast region) is in for more of the same for the foreseeable future. 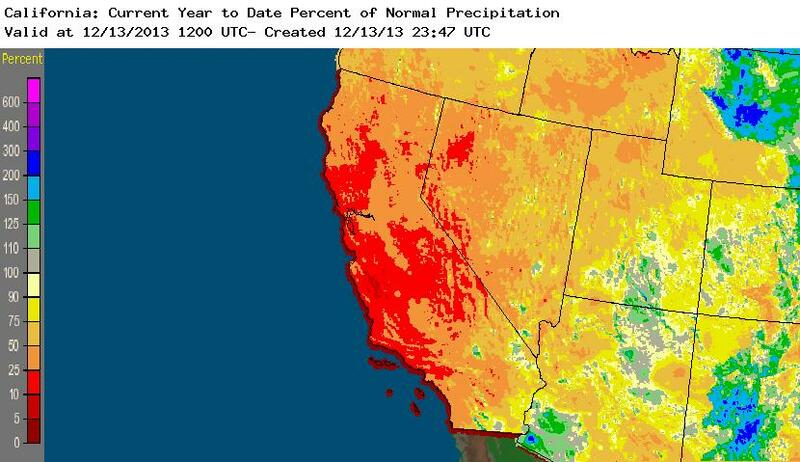 As improbable as it may seem, the extraordinary California dry spell of 2013 has continued well into the month of December, and there are virtually no prospects for relief over at least the next two weeks. 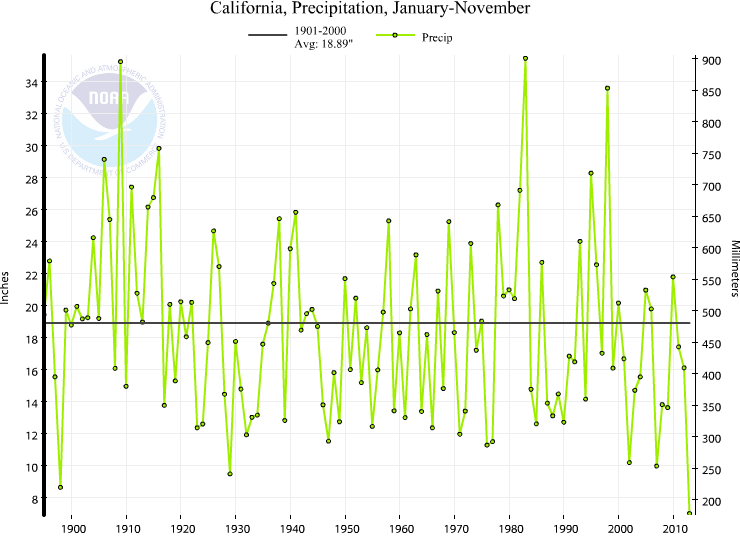 The most recent climate statistics suggest that calendar year 2013 is very likely to go down in the record books as the driest on record for the state of California, possibly by a considerable margin. Just how dry has it been in 2013? We all know that it has been extremely dry for the past year in nearly every corner of the state. Newly-released data from the National Climatic Data Center, though, starkly illustrates just have phenomenally dry 2013 has been relative to the historical record. The January-November 2013 period is not only the driest since at least 1895, but it also surpasses the previous record driest year to date, 1898, by nearly 16%! Precipitation deficits have actually grown even larger since the end of November, and given the current forecast for a continuation of exceptionally dry conditions for essentially the rest of the calendar year, I expect that it’s very likely that California will experience it’s driest calendar year on record in 2013. Also of considerable note is that the current 12 and 24-month periods are drier than any other 12 or 24 month period since 1977. 1976-1977, some of you may remember, featured one of the most acute short-term water shortages California has ever faced in the modern era due to two consecutive winters with very low rainfall and snowfall. The above chart, however, illustrates just how far behind 2013 is relative to either 1976 or 1977. While the ever-important caveat is that it would only take a couple of strong, moist storms (namely, an atmospheric river or two) to bolster our reservoir levels to a level adequate to get us through next summer, there is likely to be rapidly heightening concern in the coming months over possible water shortages in the medium and long term if the “rainy season” doesn’t actually become rainy in pretty short order.